The Toronto Rock are the envy of the rest of the NLL. Owner Jamie Dawick is putting the finishing touches on a new facility that he hopes will put Oakville on the map of Ontario lacrosse hotbeds, along with Orangeville, Peterborough, and Six Nations. 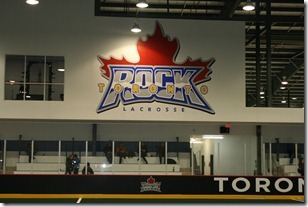 After years of practicing at the Iroquois Lacrosse Arena (ILA) in Six Nations, 100 km southwest of Toronto, the Rock now hold their practices at the brand new Toronto Rock Athletic Centre (TRAC). 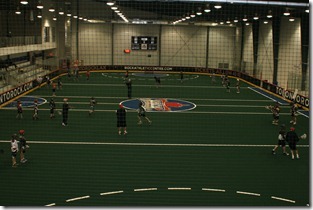 The TRAC, located near Trafalgar Road and the 403 in Oakville, is only 30 km from the ACC and is a state-of-the-art lacrosse facility. The Rock’s head office is also in the building, as is the gym run by their official strength coach, so as Dawick put it during the Toronto Rock Town Hall meeting back in December, the only thing the team doesn’t do in that building is play their actual games. The TRAC just opened in December, but is already packed almost every night of the week. The Rock hold a practice once a week, but Rock players come and go frequently. Some Minnesota Swarm players also practice there once a week, Troy Cordingley and Pat Campbell run youth lacrosse clinics, and there are Masters and youth league games there all the time. There are even floor hockey leagues and everyone from local rugby teams to the Hamilton Tiger-Cats have held events there. On January 24, Jamie Dawick invited me for a tour of the TRAC, including the Rock dressing room, meeting and training rooms, and his own office overlooking the carpeted floor. Many thanks to Jamie for the offer and for showing me around this fabulous lacrosse facility. And when I say “lacrosse facility”, I mean lacrosse facility. There are two rinks in the building, one with brand new carpet (identical to the brand new carpet on the floor of the ACC this year) and one with a concrete floor, but no ice-making facilities and no Zamboni. 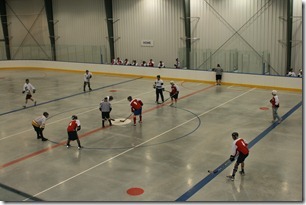 It was built specifically for lacrosse, though a local floor hockey league plays on the uncarpeted rink during the week (they were playing when I visited, see picture below). The carpeted rink was being used by Troy Cordingley’s lacrosse clinic, with Troy running drills for 30 or 40 kids, and Pat Campbell running goalie drills. 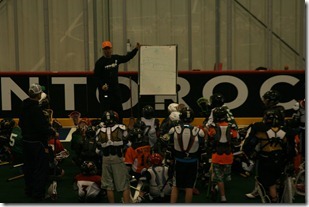 If you’re a young lacrosse player, can you imagine learning the game from an NLL coach who’s been named Coach of the Year and has won three championships, and goaltending skills from a 14-year NLL vet? 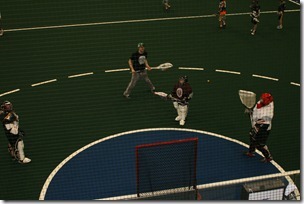 The TRAC is also home to The Box Lacrosse Store, owned by Troy Cordingley and Rochester Knighthawks coach Mike Hasen. 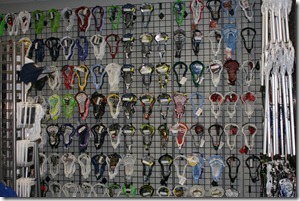 This is the biggest, and possibly only, lacrosse store in the area. As Dawick said, up to now anyone in the Toronto area would have to drive to Whitby, Orangeville (where Terry Sanderson owns Source for Sports – I wonder how he feels about his coach owning a competing store), or Six Nations in order to find a decent selection of lacrosse equipment. Despite the name, I did spot some field lacrosse equipment as well – though admittedly, an eight-foot-long lacrosse shaft isn’t overly hard to spot. After the jump are some pictures from my visit. Click on any of them for a larger version. 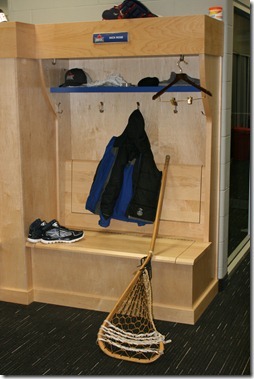 Nick Rose’s locker, with a goalie stick that’s clearly illegal. I don’t see the Reebok logo anywhere on that stick. 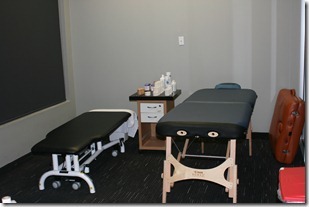 A couple of massage tables just off the Rock dressing room, next to the “coach’s room” where Troy, Terry, and Jamie watch game film for hours. 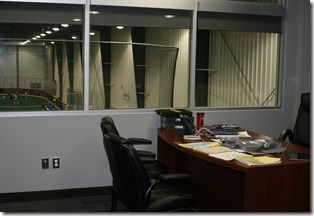 The main conference room, with windows overlooking the carpeted rink. 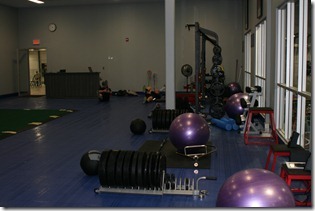 The Dynamic Athlete, a strengh training facility run by Sean Holmes, strength coach of the Rock. The turf at the left was just put down earlier in the day. 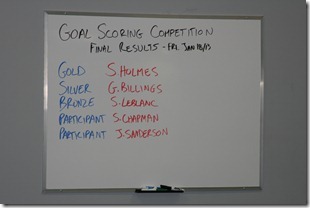 Looks like Holmes (a two-time Mann Cup winner himself) has still got it. 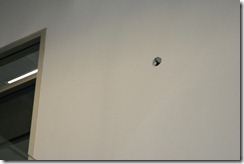 A lacrosse ball shaped hole in the wall, twenty feet off the ground. 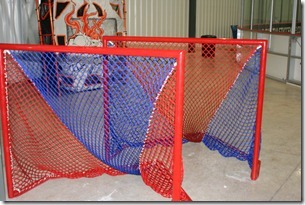 Considering the mesh behind the net, someone had to work pretty hard to put that there. 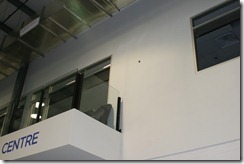 This balcony comes off of the main conference room, pictured above. Fancy Rock-coloured mesh on the nets. Likely not allowed in the NLL. The shooters probably prefer the black mesh anyway but these still look cool. 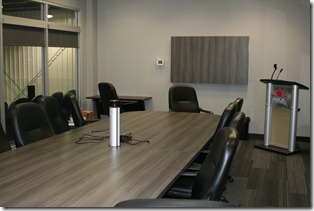 It is quite impressive how the building turned out. It's also great to see how the facility is being used by more than just the Rock!